What's yellow, likes to be peeled, and extremely freaking weird? 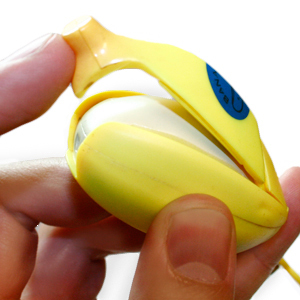 An Endless Banana Peel Keychain. 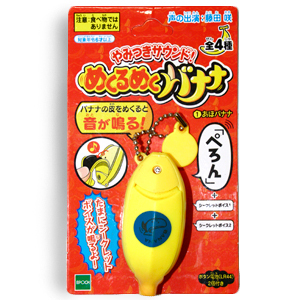 You can peel this "Banana" as much as you'd like and enjoy the little chimes that it yells out in Japanese each time. The sound is recorded by Japanese voice actress Saki Fujita (known for her work in anime voicing). This item is truly bizarre yet great at reducing stress. Anything that Stupid that reduces stress is a-ok with us. 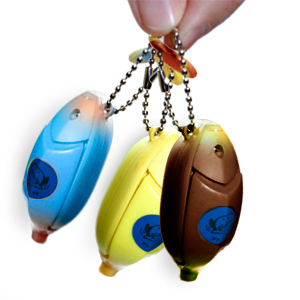 The Bananas come in three tropical colors and make for a great keychain, phone charm or necklace. If real Bananas were as entertaining we'd probably go Bananas! - One Banana per order. - Three colors available: yellow, blue, and brown. - Batteries included. - All writing is in Japanese.